Product weight is 1 lbs. 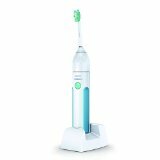 Philips Sonicare Essence 5600 Sonic Electric Rechargeable Toothb.. 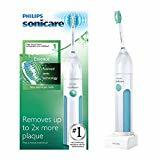 I purchased the Philips Sonicare HX5610 based on personal recommendation from my dentist (and close friend). I have been undergoing a `rejuvenation' of sorts. In the past 6 months I've made it my goal (with the help of my dentist) to have the healthiest, cleanest and whitest smile possible in preparation for my best friend's wedding. The first step was to upgrade my toothbrush from my old manual toothbrush, to the Sonicare. I chose this because he said it was what he used at ..
Vine Customer Review of Free Product (What's this?) This electric toothbrush is Sonicare's lowest level model. It has the basic features that come with every Sonicare, even the cheapest 39.99 one. I have owned a Sonicare for over 10 years and have had 3 different models. Can I tell the difference between the 3 models I have owned....not really. I brush my teeth for the 2 minutes and any other features usually don't get used on a daily basis when I am rus..